The end of the Seven Years War, known in America as the French and Indian War, left Britain undisputed control of North America east of the Mississippi. Today we are going to step away from military battles to take a look at the exciting world of 18th century British tax policy! Military victory had left Britain awash in debt and with the expenses of controlling and governing many new territories. Raising the necessary funds to pay off debt and manage the empire led to a series of policies that probably made great sense to the politicians in London. In hindsight though, it eventually led to even more conflict and another costly world war. In London, Prime Minister Grenville wanted to increase revenue. The recent war had about doubled Britain’s national debt, which was sitting at about 150% of GDP. Interest on the debt alone was a substantial and growing portion of the budget. International lenders already considered Britain a high risk. Even at high interest rates the government found it increasingly difficult acquire new loans. Since the British pound was based on gold and silver, the government could not simply print more money as it might today. With the end of the war, military costs would go down of course, payments to the German States for military defense would go down, as would subsidies to the colonies to pay for militia. The government could also shrink its army and navy. But even after cuts, there was more work to be done, not only to end the deficits but to begin reducing the debt itself. British possession of Canada would require a large and expensive standing army in North America to ensure the French population there would not attempt to return the territory to France. This would be a major added expense when compared to pre-war expenses. Grenville estimated the cost of maintaining 10,000 soldiers would be about £220,000/yr. This was down from the £350,000/yr that parliament was spending on the colonies during the war, but was still unsustainable unless the colonies could contribute a substantial amount to help cover the costs. Since we are going to spend some time talking about money and taxes, this might be a good time to go over how money worked in the British Empire at this time. Then, as now, British currency was based on the British pound sterling (£). The pound at the time was literally the value of one pound of sterling silver. It is a little tricky to convert the value of £1 in 1764 to modern US dollars. Today, in 2017, a pound of silver would cost a little over $250. I’ve looked at a bunch of attempts to calculate inflation from the 1760s to today. Any such calculation is tricky because you are comparing a wide variety of goods and services that changed prices at differing levels. A comparison of wages alone makes no sense since the standard of living for a typical worker has changed greatly. So with the caveat that others will come up with quite different conversion rates, my best calculations show that £1 in 1764 would be worth around $220 in US dollars in 2017, not too far off from simply using the value of silver then and today. In 1971, Britain converted to a decimal system. Before that, pennies and shillings were valued differently against the pound. A pound was worth 20 shillings (s), meaning a shilling would be worth about $11 in modern US currency. There were also 12 pence (d) in a shilling, meaning a penny (pence is the plural of penny) back then would be worth about $1 today. Pence could be divided further divided into farthings (4 farthings = 1 penny). So a farthing was worth about the equivalent of a quarter is for the modern American. You may also have hard of a Guinea. This was a gold coin, originally the equivalent of British pound. But because gold and silver prices fluctuated, a guinea was often worth more than a pound. In the this time period, a guinea was worth 21 shillings, just over one pound. The symbols for each British denomination are based on latin monetary terms. The pound symbol (£) is basically a fancy L that comes from the latin word librae. The s for shillings comes from the latin solidi. The d used for pence comes from the latin denarii. It might also be helpful to know how much a the typical worker earned compared to today. Wage data is a little spotty from this era. But the studies I’ve seen indicate that unskilled laborers earned about 12 pence per day for farm labor in England. A craftsman in the building trade made about 22 pence per day. Work weeks were typically six days long, meaning an unskilled laborer could take home a little over £1 per month. In other words, in inflation adjusted dollars, a common laborer had to work and support a family on less than $3500/yr. Say what you will about the problems caused by the industrial revolution. It definitely increased our expectations about reasonable pay and standards of living! Pay in the colonies, where there was less supply and greater demand for labor, was usually higher than in England. Making direct comparisons can be difficult because some colonial pay was made using colonial pounds, which tended to be worth less than British pounds. It is not always clear which currency is listed in wage records. However, records show that a common laborer in the colonies could make around 2 shillings (24 pence) per day. A more skilled worker, like a brick layer might make three times that amount. Therefore, common laborers in the colonies made about double their counterparts in England. Colonial workers with some skills made an even greater premium over their English counterparts. Even so, making £1 required a week or two worth of work for most low level working class jobs. Don’t worry. None of this will be on the test. I just thought it helpful so that when we talk about a 3 shilling tax on something, you have some frame of reference as to what that really cost people. Alright, back to Grenville’s revenue problems: Since many of the costs were coming from the need to maintain larger militaries to protect newly acquired colonies, it seemed only reasonable that the colonies could assist in shouldering some of that financial burden. British subjects in England, Scotland, and Ireland were already taxed to the hilt. One historian estimated that the average English subject paid about 23 shillings per year in taxes. By contrast, Massachusetts, which is thought to be the highest taxed colony at the time, paid about 1 shilling per year in taxes. The British colonies, in fact, were probably one of the least taxed areas in the world. British subjects were already hit with a wide variety of taxes. Import tariffs also contributed greatly to British coffers. Unlike tariffs in the colonies, British customs agents diligently collected tariffs in Britain and enforced trade laws. During the war, Parliament raised revenue by levying a new tax on cider. The opposition to the cider tax was in part because people already felt overtaxed, but also because most cider was made locally on farms in England and Wales. Enforcement, therefore, required government officials to search farms for cider production and make sure proper taxes were paid. This intrusion on people’s homes did not sit well with the farmers. This issue was a big part of what brought down Lord Bute’s ministry in 1763. It remained unpopular during Grenville’s term as well. With the war over, members are Parliament were feeling constituent pressure to lower taxes, not raise them. Increasing taxes on workers was impossible since they were barely getting by on subsistence pay. Increasing taxes on the wealthy in Britain was not a popular option either. The aristocracy controlled Parliament. Raising taxes on your friends and family was not going to go over well at home. Everyone already felt overtaxed in England. Members were in no mood to hit up voters for any more money. 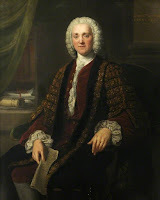 Grenville, therefore, did not see any way to get Parliament to go along with new taxes at home. Since much of the increased costs were the result of the colonies, the colonies had to cover at least some of those costs themselves. Still, with the well known sensitivity that colonists had about taxes, Grenville knew he had to tread lightly. The best place to start was with trade tariffs. Tariffs could be collected at ports, meaning one did not have send tax collectors all over the colonies. Further, tariffs on certain imports had existed for decades, even if poorly enforced. Therefore, there was no valid principle that should prohibit its collection. An easy place to start would be a tariff on sugar. Almost all the colonists’ sugar came from the French controlled islands in the West Indies, what we call the Caribbean today, - you know, the islands Britain just gave back to France in the Treaty of Paris. A tariff would actually end up putting most of the cost on the French planters, since merchants were generally unable to increase prices on luxury goods. They would be forced to pressure the French planters into lower prices in order to maintain sales. Sometimes called the American Duties Act or simply the Revenues Act of 1764, the law commonly known as the Sugar Act placed a tax on the importation of sugar, molasses, coffee, Madeira (which is a type of wine) as well as a range of other luxury goods such as silks and other textiles. Grenville thought the law would be relatively palatable for several reasons. The main one being that the law actually cut tariff rates. The Navigation Acts of 1733 (also called the Molasses Act) had implemented a tax of sixpence on a gallon of imported rum. The new law cut that in half to threepence. Who doesn’t like a tax cut? Well, no one really saw it that way because no one actually paid the tax from the Molasses Act. Tariffs under that act only brought in about £1800/yr in all colonies combined. The rate was prohibitively high and intended to cut off trade with the French colonies. Even at half the rate, the tax was high. It cost about 14.5 pence to make a gallon of rum, which sold at wholesale for around 18 pence. A threepence tax would mean the rum maker would essentially break even, unless rum prices increased or molasses costs decreased. The existing sixpence tax meant a law abiding rum manufacturer would lose money. That was why traders evaded the tax, paying off customs collectors at a lower rate to let the product into the colony. The corruption had become routine, with customs collectors taking a twopence payment for each gallon. Therefore, a threepence tax would be an effective 50% increase in the taxes. To make sure colonists actually paid the tax, the new law also overhauled how it would be collected. First, all disputes would be heard in British vice admiralty courts. In other words, naval officers would judge smuggling or tax evasion accusations, not local juries. The admiralty courts had had jurisdiction over such cases since the last century. However, it was easy and commonplace to remove the hearing to a local colonial court. Therefore, merchants always did this, and with the help of popular and persuasive lawyers like James Otis, almost always won their cases in front of sympathetic juries. This new law would force trials to go to admiralty courts in Halifax Canada, meaning difficulty of travel and almost certain prospects of the government winning the case. The law also helped customs officials by limiting the damages they might have to pay if they seized a vessel in error. Under the old law, a ship owner could sue customs officials for any mistaken seizure and count on a friendly jury to find against the tax collector. Under the new law such cases would go to admiralty courts where the customs official would stand a much better chance of winning. The new law required merchant ships to post bonds, which could be forfeited if their cargo did not match their manifests, as well as a host of other costly and confusing paperwork. Like the Molasses Act before it, the Sugar Act only applied to trade with non-British colonies. Colonists in America were free to go to the West Indies and trade with other British colonies there. The problem with that was that most of the sugar came from the French colonies. It was better quality and cheaper. The French colonies were also more eager to buy the products the North American colonists wanted to sell them, things like fish, lumber, and flour. Therefore, trade only with the British West Indies was not a viable option. Some in Parliament, however, thought that the competitive advantage for the British West Indies might eventually encourage some of the French islands to be more amenable to joining the British Empire in the future. So for the politicians in London, the Sugar Act seemed like it would solve several problems. The new law would raise some revenue, end the institutional corruption that had developed in the colonies, and also encourage French colonies to be more disposed to join the British Empire. They had gotten used to selling rum to British colonies in North America. They no longer had French colonial markets in Canada. France did not import much rum. Therefore, the colonies would get stuck making less because of the tariff. They would have greater desire to become British colonies again to enjoy free trade with North America. It’s a win-win, what could go wrong? Parliament passed the Sugar Act in April 1764 with relatively little debate or dissent. If anything, the members thought Grenville should be more aggressive in increasing tariffs on the colonies. Politically though, Grenville wanted to ease into the issue of colonial taxation slowly, lest he set off colonial revolts which would only cost the government more money to put down. Later that same year, Parliament took up another issue. 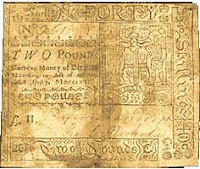 Some colonies had been printing their own paper money in order to make up for a lack of sufficient gold and silver available in North American markets. 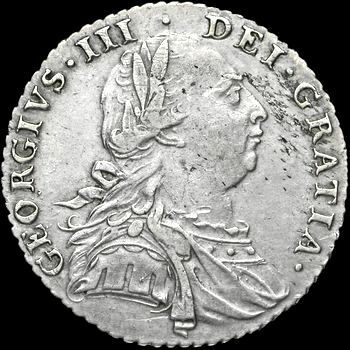 Virginia in particular had financed much of its wartime expenses by issuing paper money, which could be returned to the colonial government for payment of taxes. This provided an easy way to remove it from circulation once the need for currency fell. In effect, the paper money acted as a loan to the government. The government pays its bills now with paper, then gets it back and retires the notes instead of getting cash in later tax years. The problem for London merchants was that the colony ordered that the paper be legal tender for payment of all private debts as well. The exchange rate was set at 125 Virginia pounds for 100 British pounds. Although Virginia was fairly conservative in the way it issued the money, the Virginia pounds began to lose value, trading at around 160 Virginia pounds for 100 British pounds. Virginia plantation owners had a great deal of debt with London merchants, who were facing their own credit crisis in 1764. If Virginians could repay debt at the 1.25 to 1 ratio, London merchants would end up taking a serious loss on the repayment of colonial debts. Grenville had been contemplating a currency plan of his own to unify all colonial currencies, but did not want to tackle that problem in 1764. However, a member of Parliament, who also happened to be a London merchant trying to collect on a fair amount of colonial debt, proposed the Currency Act in order to protect his own interests as well as those of many of his colleagues. The Currency Act restricted the use of colonial paper money. It prohibited colonial legislatures from mandating that the paper be accepted for payment of private debts. In other words, the London merchants could demand payment in British pounds. Like the Sugar Act, the Currency Act raised little controversy in Parliament. New England was already under similar restrictions, having to use notes that could be exchanged for gold or silver in order to maintain value. The new law targeted Virginia’s currency law, which was seen as ripping off British merchants. Getting paid back in money worth the same as what was lent seemed perfectly reasonable to everyone in London. Clearly Grenville was proceeding cautiously and with great thought to his plans. He deliberately withheld plans for a colonial Stamp Tax in 1764 because he wanted to start slowly with the less controversial tariff policies. This would begin to pay money back to government coffers and would acclimate the colonists to the idea that they needed to contribute more to the Empire’s costs. He also tried to avoid side controversies by shutting down attempts to establish Anglican Bishops in New England, at least for now. If anything, Parliament seemed to be pushing Grenville to act more quickly and forcefully. During the debate on the Sugar Act, Grenville commented that the colonies had to contribute toward paying for their costs. The main response by some members was that the colonies should be paying all of their costs. They needed to become self sufficient, not a drain on the budget. The Currency Act was pushed on Grenville before he had been ready to act as well. Parliament overall seemed more eager than the Prime Minister to shift into a peacetime economy and get colonial revenues headed in the right direction. Yet as carefully and as slowly as they moved, it did not seem to occur to anyone in Parliament to involve the colonies in any of the plans. Many of the colonies had agents in London who essentially acted as lobbyists. Colonial Governors also could have performed an ambassadorial role, providing feedback from the colonial legislatures and popular opinion to help shape policy. Governors certainly provided intelligence on reactions to policies already in place, but did not work on shaping future policy. 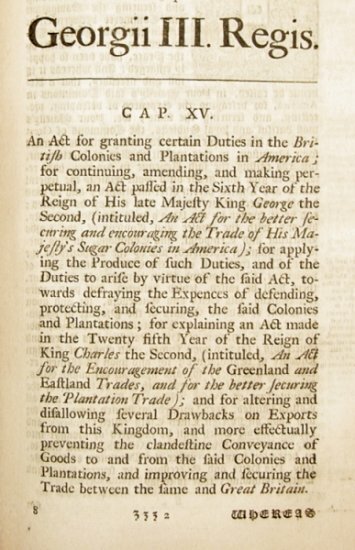 Parliament considered tax and trade policy to be well within its authority for the entire empire. There seemed to be little dispute on that in London. The colonies, however, had an extremely different view, which would soon become evident. Next week: the colonists express their opinions on the new acts of Parliament. Anecdotes of the Life of the Right Honourable William Pitt, Earl of Chatham, Vol 2, by John Almon (1810). British colonial policy, 1754-1765, by George Louis Beer (1907). History of Wages in the United States from Colonial Times to 1928, by Estelle May Stewart & Jesse Chester Bowen (1934) (Google Books). The Grenville Papers, Vol. II, William J. Smith (ed) (1852). Correspondence of William Pitt, Vol. 2, by William Taylor & John Pringle (eds) (1838). 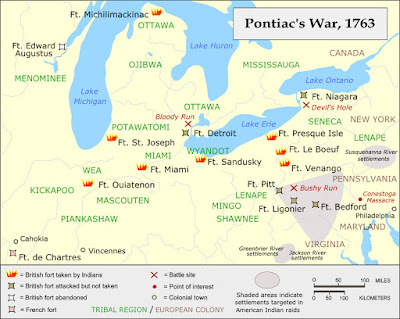 Throughout the summer of 1763, in what became known as Pontiac’s War, Indian tribes all across the northwest rose up to destroy British forts and settlements. Warriors launched attacks all across western New York, Pennsylvania, Maryland, and what is today Ohio, Michigan, and Indiana. The British were ignoring promises to keep settlers east of the Allegheny mountains. Without the French to act as a counterweight, the Indians realized they needed to go to war if they wanted to protect their lands. Last week, I went over all the major attacks over the course of the summer, often killing and mutilating without mercy, taking no prisoners, and wiping out soldiers and civilians alike. While their ferocity destroyed settlements and spread fear, Indians never seemed to be able to maintain a sustained war over time. Warriors needed to return home to feed their families. 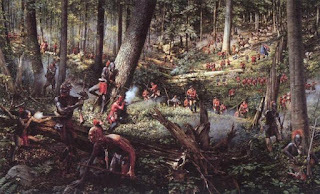 Pontiac and his allies had hoped to encourage the French to rejoin the fight once they saw the Indians in full scale war against the British. But the few French garrisons still along the Mississippi were already planning to leave. Alone and without a European power to provide arms and ammunition, even united tribes could not sustain a war footing. They could not remain in battle for more than a few months. As summer turned to fall, and the fighting season ended, many warriors simply returned home. By winter 1763, the Indian threat in Pennsylvania had been neutralized, yet anti-Indian sentiment flourished. In December, a mob from Paxton, Pennsylvania raided a nearby village of Christianized Indians who has played no role in the uprising. Some from Paxton accused them of providing aid to Indians who had participated in earlier raids. It seems more likely though that their fears had given rise to the attitude that the only good Indian was a dead Indian. They massacred and scalped six Indians who they found sitting in their cabins. Amid further threats, officials took 16 Susquehannock men, women, and children into protective custody to prevent their massacre. The Paxton vigilantes were undeterred. 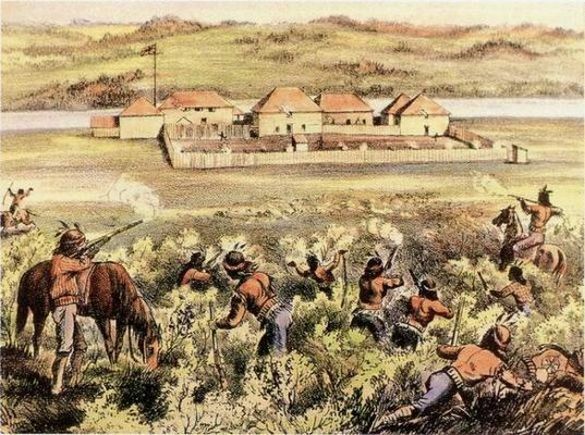 Two weeks later, they attacked the Lancaster jail where the Indians were being held in protective custody. The killed, scalped, and dismembered the bodies of the Indian men, women, and children. In January 1764, 250 Paxton vigilantes marched on Philadelphia to demand further government action against the Indians. Instead, they found that most Philadelphians were shocked and appalled by their actions. They ended up providing the legislature with a list of grievances and returning home. 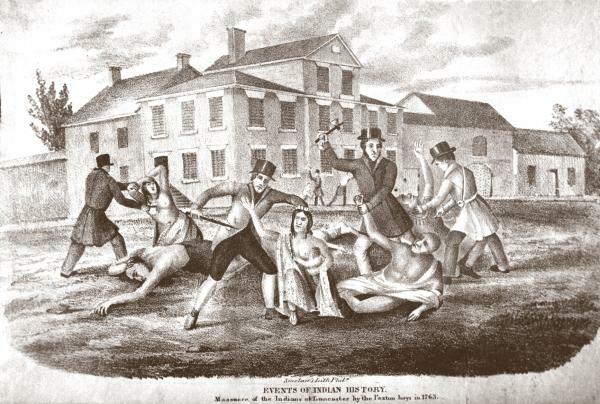 Although the violence ended, no one was ever prosecuted for the murder of the Indians, despite some attempts by the Governor to find the perpetrators. It took months for Gen. Amherst to receive intelligence on the attacks on distant outposts and to appreciate its enormity. Once he did, he had no intention of working out a diplomatic solution. These attacks required a harsh response. As he assembled armies to counter the uprising, Amherst issued orders that no Indians be taken prisoner. As with the Cherokee uprising a few years earlier, he ordered any captured Indians from tribes involved in the uprising to be executed on the spot. When Amherst heard about Fort Pitt’s use of biological warfare in spreading smallpox to the warriors, he approved reimbursement costs for the smallpox infested blankets and recommended that same plan to other officers. As one officer writing to Amherst put it, he wished “to extirpate that Vermine from a Country they have forfeited, and with it all Claim to the Rights of Humanity.” The Biological Weapons Convention of 1972 was still more than two centuries in the future. In the 1760’s use of smallpox as a weapon did not seem to be an issue for much of anyone. I should also add that many have considered it racist that the British used smallpox as a weapon against the Native American tribes. However, as we will see in future episodes, they seemed equally willing to use it against the rebels during the Revolution. It just was not quite as effective as many Patriots got inoculations. Although many tribes rose up in this fight, the Iroquois remained loyal British allies, with the exception of some Seneca who had been involved in the Devil’s Hole Massacre. 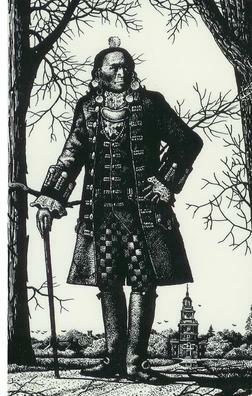 William Johnson, who lived among the Iroquois, was able to maintain the loyalty of most of the Six Nations throughout the uprising. Johnson attempted to get Amherst to make use of the loyal Iroquois, who believed they had the power to suppress the Indian uprising in the Ohio Valley, at least enough to bring them to the bargaining table. 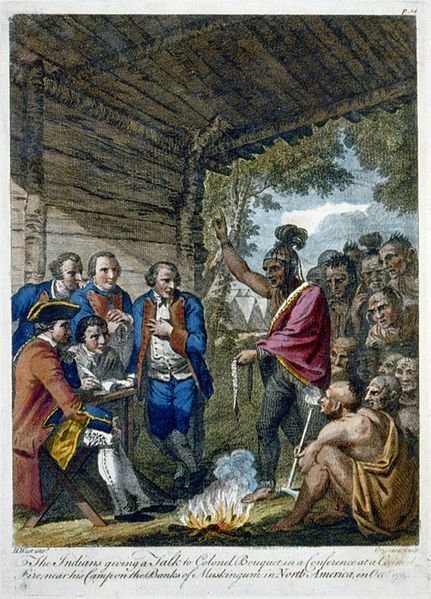 Even though Johnson and these same Iroquois had proven their value to Amherst during his Montreal Campaign in 1760, he refused to make use of them. Instead, he continued his policy of destruction, killing all enemy Indians, burning their villages, destroying their food supplies and spreading smallpox among them. Once the Indian forces had used up their ammunition and supplies, unable to obtain more, Amherst believed he could defeat the warriors in a war of attrition. Amherst was not the first commander to earn the scorn of Sir William Johnson. Like others before him, he would pay the price as Johnson contacted his friends in London to criticize the commander’s policies that were only exacerbating and extending the war. 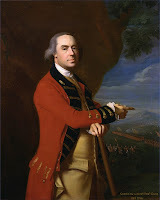 In August, Amherst was recalled back to London and Gen. Thomas Gage took command. Amherst had been requesting for years to be relieved of command. With the war over, there was little glory in commanding North America. He wanted to return to Britain. Now overseeing an all out Indian war, officials in London decided that maybe it was time for new leadership. Again, like most Generals brought home in defeat, Amherst would move on to better things. He had been appointed Governor of Virginia in 1759 and continued to hold that post until 1768. He only lost that job after officials decided that having been Governor for nine years, it might be nice if he actually visited the colony. When he declined, London appointed a new Governor. 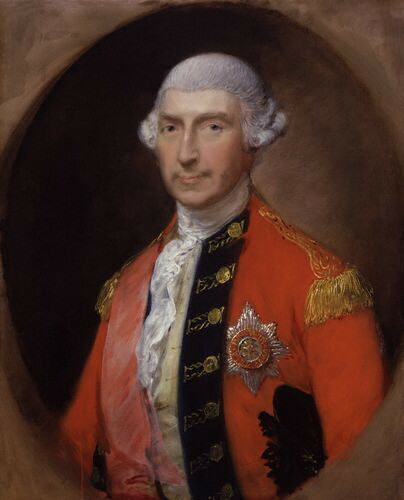 Amherst would eventually be promoted to full General and later Field Marshall. He would also join the King’s Privy Council and become a Baron. But in 1763, Amherst left America, never to return. I’ve mentioned the new North American Commander, Thomas Gage, a few times before. But now with his first command, and given his future importance to the story, I should probably give a little more background. Gage was the son a Viscount, but as the second son, he likely would never inherit a title or property. Instead, Gage had joined the army at the age of 20 to fight in the War of Austrian Succession. He returned to Britain to help put down the Jacobite Rebellion, participating in the slaughter of Scottish rebels at the infamous Battle of Culloden in 1746. A few years later he shipped off for North America, serving under Braddock and alongside George Washington in 1755. For most of the French and Indian War, Gage could not get in a position to prove himself in battle. He was part of the relief force to Fort Oswego, that arrived too late. He was part of Gen. Loudoun’s mission to take Louisbourg, which simply turned around and did not fight a battle. Gage did finally see battle again at the first failed attempt to take Fort Carillon, in which he was wounded in 1758. While recuperating, he went to New Jersey to recruit a new regiment of colonists. There, he found time to marry a local Jersey Girl, Margaret Kemble, and start a family in America. He continued to serve throughout the French and Indian War, serving under Gen. Amherst when he defeated the French in Canada in 1760. Yet when Amherst decided that Gage acted with too much caution in failing to attack a small French outpost, he gave Gage a position in the rear during the final assault on Montreal. After the city fell, Amherst gave him an administrative job as the military governor of Montreal. 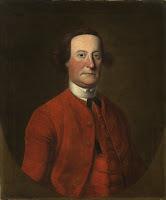 When officials recalled Amherst in 1763, Gage became the new North American Commander. Because Amherst had only been “recalled for consultation” and Gage made temporary commander, Gage may not have felt confident significantly altering Amherst’s plans for 1764. Gage, therefore, went forward with Amherst’s plans to defeat all the tribes militarily with only about 8000 regulars left in America. Gage did allow Johnson to negotiate a treaty between the loyal Iroquois and the renegade Seneca who has taken part in the uprising. 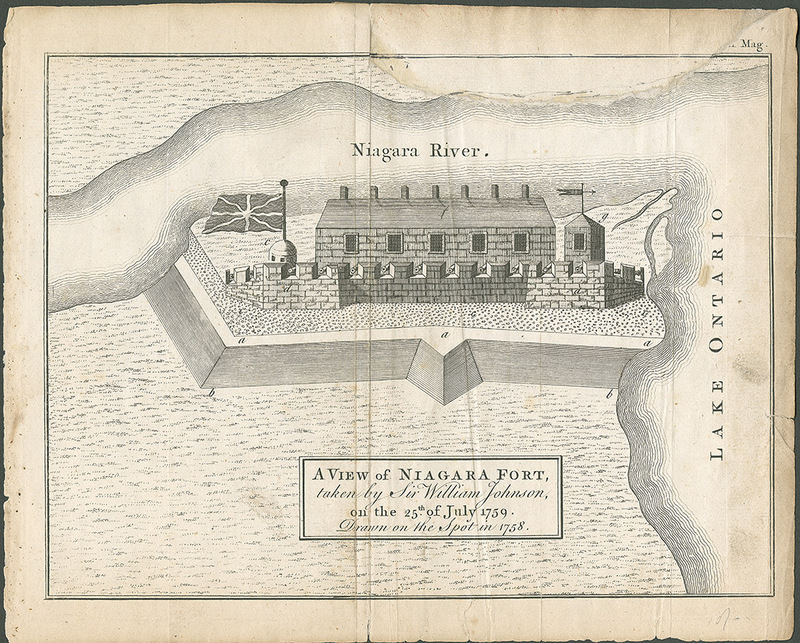 The Seneca signed the Treaty of Fort Niagara bringing them back into the British fold. The Treaty negotiations at Fort Niagara, made clear that most of the Ohio Valley tribes were also ready to settle. By the summer of 1764, it was clear to all tribes that the French had no intention of re-engaging in North America. The natives were on their own, and would remain dependent on the British for trade. Smallpox had also decimated many tribes throughout the winter of 1763-64. This may have been in part the result of British attempts to start such an epidemic, or more likely the inevitable result when Indians came into increased contact with Europeans and each other. 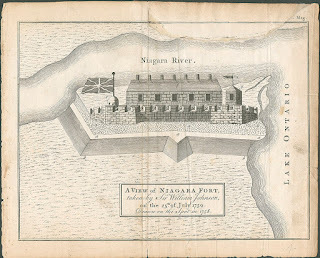 Although the meeting at Fort Niagara was primarily for the purpose of bringing the Seneca back under the Iroquois fold, representatives from 24 different tribes attended. They received gifts from the British and expressed a desire to end hostilities. The Seneca did agree in the final treaty signed on August 1, 1764, to pledge loyalty to the British. They were also forced to give up their monopoly over the Niagara portage as the price for their attacks. At the same time Johnson was negotiating the Fort Niagara Treaty, Gen. Gage was executing Amherst’s orders to strike at the heart of the Indian rebellion militarily. By this time though, everyone seemed to have lost their thirst for blood. The first prong of this now half-hearted invasion called for Col. John Bradstreet to leave Fort Schlosser in Western New York, sail across Lake Erie with a force of 1200 men, subdue all the Indians along the way, and eventually reinforce Fort Detroit. 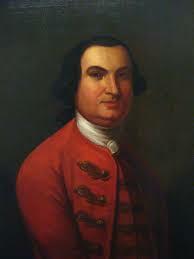 This is the same Col. Bradstreet who led the raid on Fort Frontenac back in 1758. Ever since then, he had been sitting in a cushy quartermaster job in New York. It is not clear if he wanted this new combat role, but it is clear he did not see any good way to use 1200 men to lead a path of destruction through thousands of angry warriors across hundreds of miles. 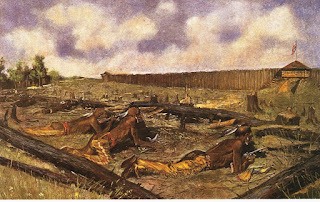 Fortunately for Bradstreet, the Indians did not see much point in fighting any more either. As he continued along the way, he offered similar terms to the tribes he encountered, directing them to attend a summit that he would hold in Detroit in September. Bradstreet, though, was not authorized to enter into treaties on behalf of Britain. His orders were to suppress any opposition and perhaps arrange for a temporary ceasefire. It was not until late September, after Bradstreet had relieved the garrison at Fort Detroit and held his summit with the tribes that Gen. Gage’s letters finally caught up with him telling him he had far exceeded his authorization and to stop making peace terms with the tribes. In any event, the Detroit meeting was a disaster even before Gage’s letters arrived. Pontiac refused to attend. Bradstreet insulted the rest of the Indians by using a hatchet to chop up the peace belt that Pontiac had sent. Ignoring Gage’s orders to march inland and attack various tribes (which would have been suicide), Bradstreet tried to return via Lake Erie, only to be run ashore by storms. 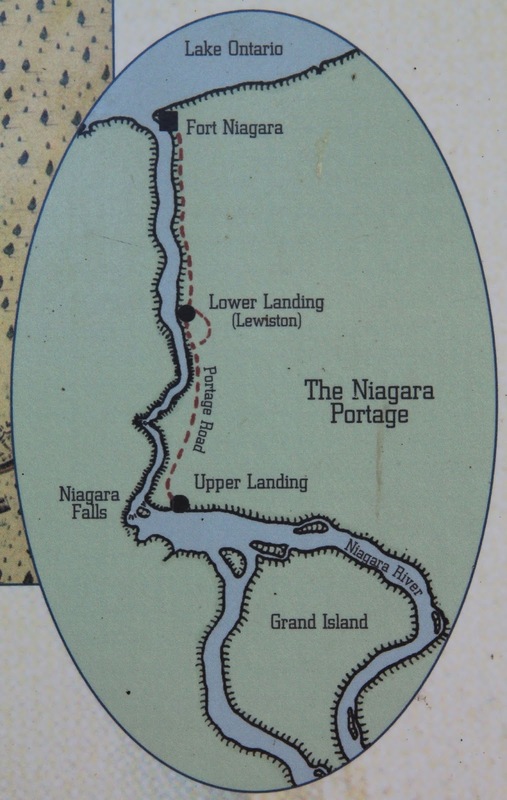 Without enough boats, much of his contingent, including all the Indian auxiliaries he had with him, had to travel by foot overland back to Fort Niagara without proper supplies. Many of them died from from exposure or starvation along the way. Even worse, the tribes which had agreed to end the war and to return prisoners neither stopped their attacks nor actually returned any prisoners. As Bradstreet was returning in October, Col. Bouquet was setting out from Fort Pitt on his own expedition into the Ohio Valley. Bouquet had started late and moved slowly. His experience at Bushy Run the year earlier made him cautious of ambush. After setting up a defensive stockade, Bouquet met with area chiefs and offered terms similar to Bradstreet’s. He made clear, however, that any final treaty would have to be made with William Johnson back in New York. Several tribes actually brought them about 200 British prisoners with promises to return more to Fort Pitt in the spring. By the end of November, Bouquet arrived back at Fort Pitt convinced that hostilities were coming to an end, at least in the Ohio Valley. Further west, in the Illinois territory, Pontiac and another more hawkish Chief named Kaské continued to make war on any British they could find. They captured several small diplomatic parties. Kaské wanted to torture and kill them, while Pontiac decided to allow them to return, indicating he was at least ready to talk peace. Facing a new, expensive and difficult offensive in Illinois in 1765, Gage reached out to Pontiac hoping to find a diplomatic solution. 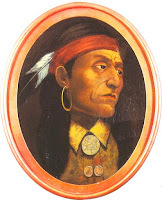 He sent George Croghan, the Indian trader from Pennsylvania who had worked with Washington’s first incursion into Ohio back in 1754 and who had continued to trade with the Indians and establish British settlements through the intervening years. In Illinois, Kaské attempted to burn Croghan at the stake. Pontiac, however, saw continuing war as pointless, spared Croghan and agreed to travel to New York. He and Johnson signed a treaty at Fort Ontario on July 25, 1766. The Treaty only announced a general acceptance of British sovereignty. It did not cede any land to the British nor even return prisoners. Even that was too much for Kaské, who crossed the Mississippi with other refugees who refused to live under British rule. Pontiac is sometimes credited with leading this entire effort. It seems clear though that he was among a group of many chiefs representing many tribes coordinating this effort against the British. Pontiac was merely the first to act. 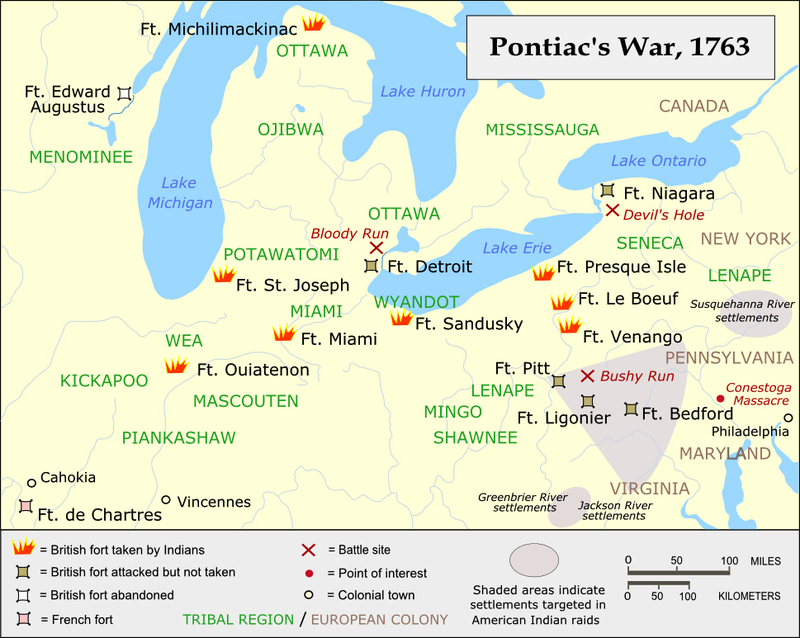 Pontiac’s War, sometimes called a rebellion, uprising, or conspiracy, was the first concerted effort by almost all tribes to halt the advancement of Europeans across North America. At best, it slowed things for a few years. It did convince the British that the native tribes were a force to be reckoned with and could not be taken for granted. If anything, Pontiac’s decision to end the fighting humiliated him among tribes who still wanted to fight. He lived in relative isolation for the next few years, before a Peoria Indian murdered him for unknown reasons. Following the end of the fighting, Britain decided to renew its tradition of providing annual gifts to the various tribes, and making more of an effort to keep settlers out of western Indian lands. 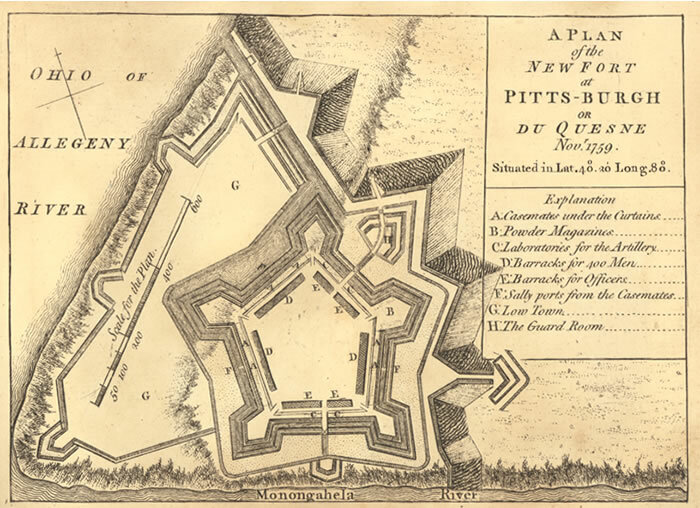 The British also eliminated many of the smaller western forts, and only kept a few of the larger ones, like Fort Detroit and Fort Pitt. 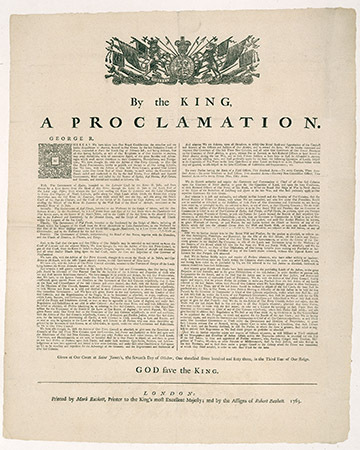 The same year the uprising began, King George III issued the Royal Proclamation of 1763, which largely forbade any British settlements west of the Allegheny Mountains, providing a reserve stretching the length of the Continent from the Alleghenies to the Mississippi River for use of the Indians. The Proclamation which was based largely on the agreements of the 1758 Treaty of Easton, was under preparation even before the news of Pontiac’s War reached London. The news probably did speed up its release and distribution. The Proclamation by itself, however, did little. The Indians had no reason to believe yet another piece of paper with promises on it. It probably added something to those already predisposed to end the violence. However, few tribes seemed to put much faith in it. On the other side, the colonies were outraged that they would be barred from the land over which they had just fought a whole war to obtain. Why exactly did we just spend millions of pounds and sacrifice thousands of lives to give the Indians a private reserve? It helped stoke the frustration colonists felt over having virtually no say over major policy questions. The war ended up for many being another one where the colonists sacrificed greatly only to see London give away any gains they had made. One reason the colonists did not get too outraged about it is that most of them figured it would be treated much like most other edicts from London. The colonists would largely ignore it and eventually it would go away entirely. As Washington wrote in a letter to a friend also involved in land speculation, “I can never look upon that Proclamation in any other light (but this I say between ourselves) than as a temporary expedient to quiet the Minds of the Indians and must fail of course in a few years…” In other words, whatever the King said, western colonial expansion could not be stopped. Once it became clear that British policy would not permit a settlement boom in the west, Gage decided to reduce the military presence as well. He abandoned several of the smaller outpost that had been easily overrun. Troops in larger forts such as Fort Pitt or Fort Detroit were reduced to a few dozen soldiers, not even enough to maintain upkeep on the Fort, let alone defend it if ever attacked again. The main purpose of maintaining any soldiers at all was simply to keep guard on the valuable canon left in the forts. The military presence throughout the Ohio Valley, the Illinois valley and the Great Lakes region fell to around 350 Regulars. With the region at peace, more soldiers only incurred unnecessary costs for the government. The military essentially pulled out and went home. I’m sure that won’t cause any future problems. Next week: Britain starts looking for way to pay back its war debts, and looks to the colonies to help pay the bill. It passes the Sugar Act and the Currency Act of 1764. Last week, we talked about the end of the the Seven Years war with the Treaty of Paris in 1763. With the war over, American colonists began paying more attention to domestic issues. Today I want to look at three issues that begin to define how the colonists were beginning to see their interests as separate from those of Britain. The first, the Parson’s Cause, flared up in Virginia during the war. According to colonial law, the colonial government paid ministers (Church of England only, of course) with tax money. Because real gold and silver money was so hard to come by in the colonies, and paper money varied so much in value, payments to ministers came in a more stable currency, tobacco. The most recent law of 1748, passed by the Colonial legislature and approved by the King’s Privy Council, permitted each minister to be paid 16,000 pounds of tobacco annually. The minister could resell it locally, smoke it, or ship it off to London. In practice though, the Burgesses paid ministers the cash equivalent of 16,000 pounds of tobacco in Virginia currency. While tobacco retained good value every year, like any commodity, its value also fluctuated greatly depending on supply and demand. In some years the price was so low, that the legislature had offered supplemental payments to ministers. In 1755, though, the price of tobacco soared and the ministers would have gotten quite a benefit. The price was also high because tobacco crops came in short that year, meaning the rich plantation owners were doing worse previous years. Since the House of Burgesses was run by plantation owners and not ministers, they found it quite reasonable to require ministers be paid that year in paper currency at 2 pence per pound of tobacco, well below market rates. For 16,000 pounds of tobacco, that would be about £133 in Virginia currency, which was worth less than British pounds sterling. The legislature wisely set the pay change to last only 10 months, which meant by the time any complaints reached London, and policies overridden and returned to Virginia, the period of change would be pretty much complete. As a result, the ministers grumbled but did nothing. Then again in 1758, tobacco prices reached extreme highs, though this time there was no particular shortage, just high prices because of heavier demand. It should have been a good year for everyone. Still, though, the plantation owners saw no need to give the ministers a bonus and again offered £133 in Virginia currency for the year. Since paper was depreciating even faster this year, the ministers had an even worse deal than in 1755, and this law covered two full years. This time, the ministers appealed to the governor, who passed the buck over to London. In response, the Privy Council in London sent back an opinion that essentially said: The law approved by the King guarantees the value of 16,000 pounds of tobacco. You cannot simply break that contract retroactively and pay less, especially through a law not approved by the King. With that ruling in hand, several ministers went to court in Virginia to get their money. The local courts, however, did not agree with the Privy Council. Several local juries, in no hurry to give extra cash to ministers, simply found for the defendants and refused to award any damages. Everyone understood that more money to all the ministers only meant higher taxes for everyone else. Also, many Virginians were not even Anglicans in the first place, and objected to payments to Anglican ministers only. Therefore, local juries were not particularly inclined to hand over large awards in court, no matter what the law said. In one celebrated case, Rev. James Maury of the Fredericksville parish won his case. The case then proceeded to a second trial on damages. At that point, the defendant’s lawyer wanted out of the case. The damages trial was a waste of time. Pay under the law should have been around £400 based on the market price of tobacco. The plaintiff had been paid £133, so anyone who knew basic math knew that damages were around £267. The defendants, however, seeing juries refusing to pay awards in other cases, decided to try their luck contesting the damages. They hired a new young lawyer who had been practicing for less time that this case had been in dispute. 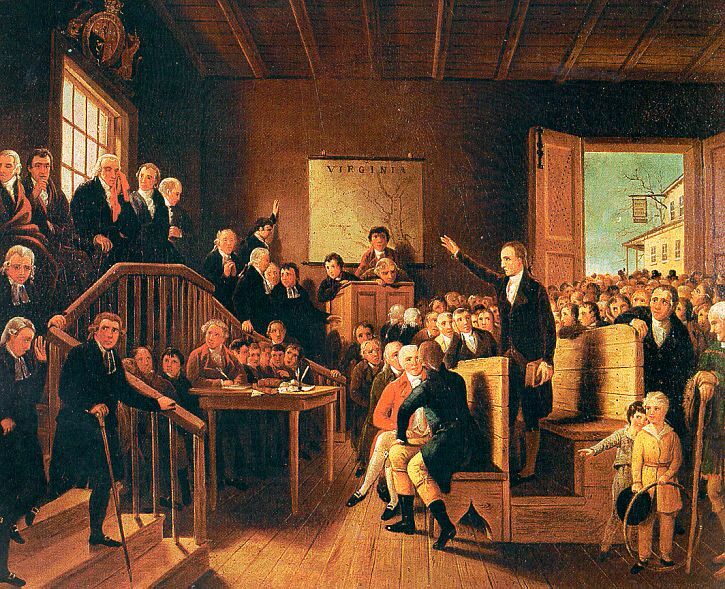 Patrick Henry became a lawyer in 1760, after spending several weeks reading legal cases at a Virginia law office. The case had taken years to reach this damages trial in 1763. Defendants hired Henry hoping he could work some magic, despite the facts and the law being on the plaintiff’s side. The plaintiff’s attorney made the damages case short and simple. He put up two witnesses attesting to the value of 16,000 pounds of tobacco in 1758. Given that value, and subtracting what the ministers had already received, that was the damages. OK, now the Jury can see the math, render its decision, and we can all go to lunch. Henry used a legal technique once described to me by a law school professor: if the law is not on your side, pound on the facts. If the facts are not on your side, pound on the law. If neither is on your side, just pound on the table. Henry simply ignored the facts and law of the case as they were clearly against him. Henry gave a long speech to the jury lasting several hours. There are no written records of the speech, but witnesses afterward said that Henry’s focused on the idea that the government paid ministers to help convince the people to obey the laws of society. 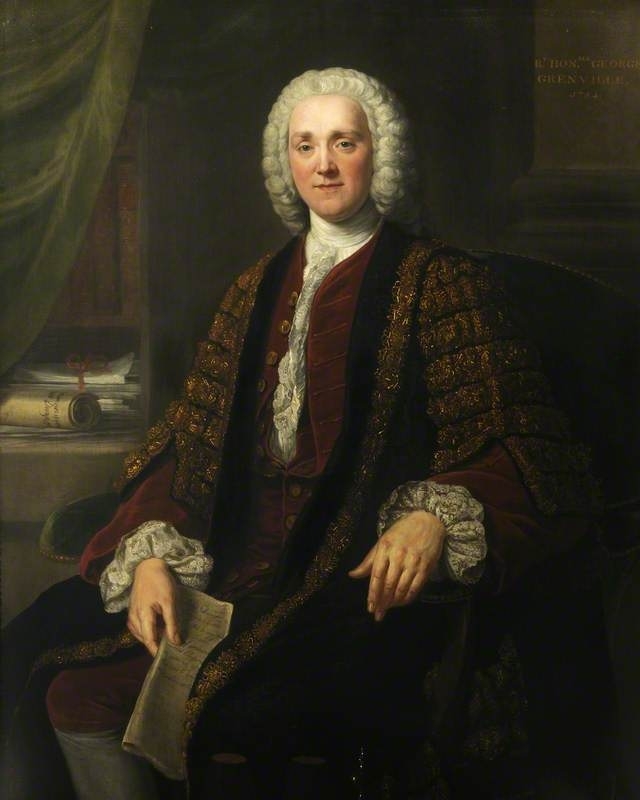 In this case a minister was advocating that courts should ignore the legislative act giving him £133 for 1758. Since he was opposing the law, he should get nothing. The fact that the King had also voided the law only showed that the king was acting as a tyrant and should also be ignored. Henry also attacked the ministers for attempting to unjustly enrich themselves by taking so much money from the impoverished people of Virginia. Although several judges on the panel thought his speech was treason, they did not cut off his argument. The jury, on the other hand, was much more disposed toward the argument and awarded the plaintiff one penny in damages. This case made Patrick Henry a local hero and sees his new practice grow rapidly. Aside from introducing young Patrick Henry, who will play more of a role later in our story, this case also shows how colonists viewed the importance of juries in ensuring that laws were executed as the people saw fit, not as those in London many have wanted. It also served as an example to the British that American juries could not be trusted to enforce the law. Finally, it provides some insight into the growing American frustration with having to pay taxes to support ministers that they did not particularly like. If the Parson’s Cause showed how much Virginians disliked excessive taxes, objected to interference from London in local affairs, and were not fans of the Church of England, you could probably multiply those sentiments several times over when it came to the colonists in New England. The Puritans, of course, founded Massachusetts for the primary purpose of getting away from the Church of England. They wanted to practice their Congregationalist form of Protestant Christianity. Technically, the Puritans only wanted to “purify” the Church of England, also called the Anglican church and today called the Episcopal church. But in practical terms, the Congregationalism practiced in New England was entirely separate from the Anglican Church. Leaving aside the many doctrinal differences, one big structural difference was that they did not rely on Anglican Bishops to appoint ministers. Local parishes controlled hiring ministers and just about everything else related to the local church. Originally, Massachusetts only permitted Congregationalist churches. Eventually, though, the colony had to allow the establishment of Anglican churches. The first one, King’s Chapel in Boston, was established in 1688, more than 50 years after the colony’s founding. Over the years, a few more popped up around the colony, but Anglicans probably made up less than 3% of the population. In 1742 the colony even permitted money from Anglican taxpayers to go to the Anglican churches rather than all church taxes going exclusively to Congregationalist churches. The Anglican Church had several mission churches in the colony, dedicated to converting local Indians to Christianity. The reality, though, is that almost no Anglicans nor Congregationalists put much effort into missions work by the 1700s. It probably did not help the cause that early conversions and creation of Indian “praying towns” ended up with the Christianized Indians eventually being killed or forced out of their lands. That seemed to put a damper on more Indians joining such towns. In 1760 though, the Anglicans began work on Christ Church in Cambridge, right next to Harvard College. Christ Church was a mission church, seeking to bring people into the Anglican faith. But, there were no Indians anywhere near the Church, only good Congregationalists. While Congregationalists thought it was all well and good to convert heathens or Catholics to Anglicanism, it was not appropriate to drag pious Congregationalists back into Anglicanism. In 1762, the colony created its own Mission Society for the Indians, working to convert them to the Congregationalist faith. Back in England, the Anglican Archbishop of Canterbury opposed this and got the Privy Council in London to disallow the Act in 1763. The colonists took this as an affront to their religion, which many in Massachusetts saw as a fundamental cornerstone of their society. The Anglicans in London were preventing the Congregationalists in Massachusetts from bringing their own local Indians to Christianity. That same year, Archbishop Thomas Secker in Canterbury published his own pamphlet, anonymously, An Answer to Dr. Mayhew’s Observations, which supported his goals of bringing more Anglicans to the colonies and attacking many of the past practices in Massachusetts. This set off another flurry of articles and pamphlets in Massachusetts as divisions grew deeper. 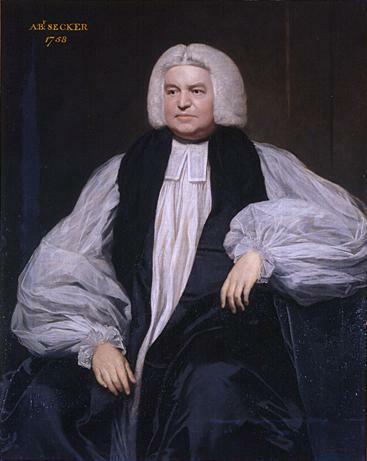 Around this same time, Secker decided this would be a good time to foist an Anglican Bishop on Massachusetts, and force the colony to pay for it. He had been planning this for some time and discussed his plans with members of Parliament. Leaders in Parliament sensibly thought it foolish to throw another controversy into the debate and put off the suggestion. Despite not even bringing it to a vote, word of the attempt reached Massachusetts and set off another round of concerns about Parliament’s power to get involved in colonial affairs. While religion and taxes were always touchy issues, trade laws affected how most colonists made a living, either directly or indirectly. Much of New England made its livelihood from the trans-Atlantic trade. Other colonies had large trade economies as well. Much of this was deliberate. Britain benefitted greatly from the raw materials imported from the colonies. Britain did not want the colonies to develop local self sustaining industries and economies. Rather, it wanted colonists to supply raw materials to Britain and buy finished goods from Britain. This provided jobs for the British people and provided the government with some revenue, primarily extracted at the ports in England. Colonial trade had long been a simmering issue between London and the Colonies. Although trade restrictions and customs duties had been in place for more than a century, most people traditionally ignored them. British customs agents often lived in England and collected their pay without even seeing the harbors they were supposed to administer. Those who were on location often took bribes that allowed merchants to avoid most or all duties, as well as ignore restrictions on trade with other countries. Any customs agent foolish enough to try to enforce the law, could find himself in court, with a hostile jury forcing him personally to pay monetary damages to merchant traders. 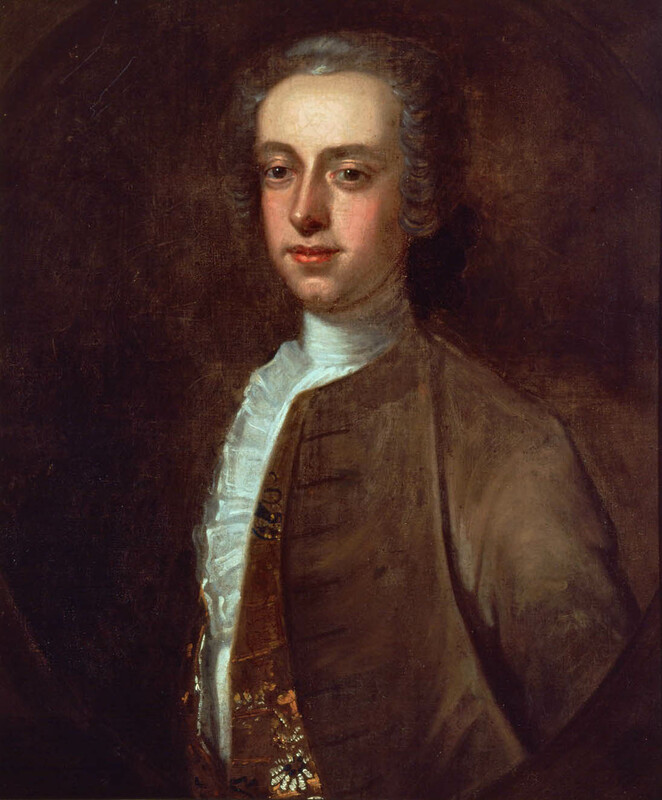 In the summer of 1760, Secretary of State William Pitt ordered colonial governors to crack down on trade with the enemy, which he saw as hampering the war effort. This was not just about tariffs going unpaid. This was more about New England ship captains engaging in trade with the same French colonies in the West Indies that the British were planning to invade. Such trade was giving direct aid and comfort to the enemy. Outgoing Massachusetts Governor Thomas Pownall began to see his position as a career dead end. Getting the colonists to follow any British instructions seemed impossible. He left for England in June 1760 in pursuit of bigger and better jobs. Although he received an appointment to become Governor of South Carolina, he never went there, instead getting elected to a seat in Parliament. You may have already noticed this trend, but royal governors often had no specific affiliation with the colony the governed. It was quite common, even the norm, for royal governors to move from one colony to another and eventually back to England. NJ Gov. Francis Bernard became the new Massachusetts Governor. Bernard decided to push Pitt’s initiative to crack down on illegal trade. It probably didn’t hurt that the Governor received a share of the proceeds of any ships seized in any smuggling. Even if Bernard had done everything else right, this highly unpopular enforcement of trade laws probably would have been enough to get the entire colony to hate him. But this was not his only misstep. In hindsight, Bernard probably made his biggest mistake almost immediately after taking office. He appointed his Lt. Gov. Thomas Hutchinson to be the Chief Judge of the Massachusetts Superior Court of Judicature (the colony’s highest court). Hutchinson had been Lt. Gov. under Shirley, who was his patron, and also under Pownall. But Pownall never really trusted Hutchinson because of Hutchinson’s relationship with Shirley. Even though Pownall ended up adopting many of Shirley’s policies, he always seemed to regard his predecessor as a crook, and did not trust anyone associated with him. Bernard probably thought he was giving a plumb job to a capable man who had been No. 2 for many years and was ready for advancement. 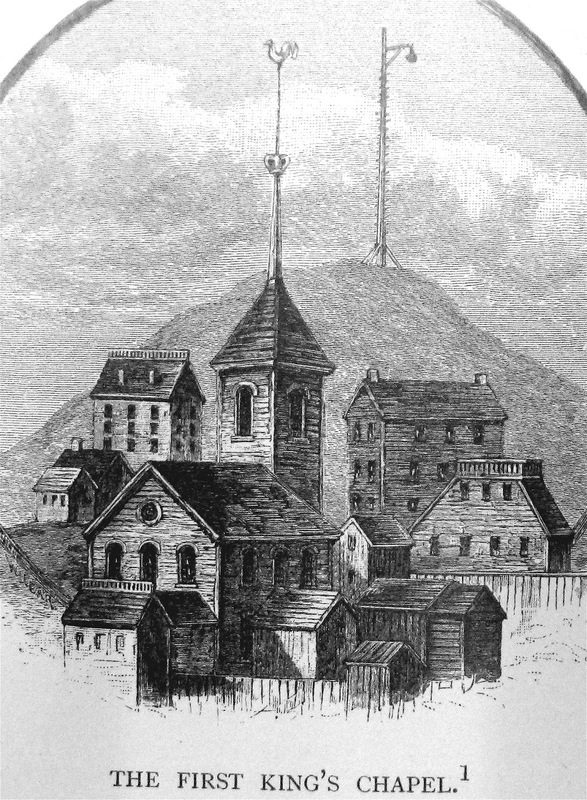 Hutchinson came from a wealthy and prominent New England family. Improving relations with local colonial leaders helped make a royal governor more effective. Hutchinson, though a capable politician, was not even a trained lawyer. 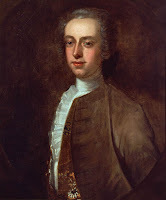 More importantly, Governors Shirley and Pownall had both promised that the position of Chief Justice would go to James Otis, Sr. a prominent attorney who had served as the colony’s Attorney General and was a member of the Council of Massachusetts. 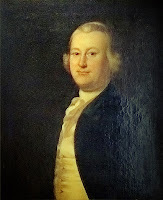 When Bernard failed to follow through on the promises of his predecessors, James Otis, Jr. took Hutchinson’s appointment as a personal affront to his father. Otis Jr., a lawyer in his own right, had been the Advocate General of the Admiralty Court, the prosecutor for cases involving smuggling, customs, and other trade violations. Otis immediately resigned his position and began representing merchants who were being prosecuted by the colony. Overnight, Otis went from being a member of the colonial establishment to one of its most outspoken opponents. In 1761, the Massachusetts surveyor general of customs applied for a routine renewal of his writs of assistance. These were general warrants that gave him the right to search any warehouses or homes for suspected smuggled goods. It was essentially a free pass to enter any private property and look for evidence of a crime, even without any suspicion that he would find anything. Otis opposed the writs in compelling arguments discussing the “natural rights of man” the tyranny and oppressive nature of such warrants, and how it was destroying their common law rights. His opposition received considerable publicity and made him a hero within the colony. It was enough for Chief Judge Hutchinson to write back to London for confirmation that such writs were legal. After receiving such confirmation, he issued the writs. The people of Massachusetts, however, agreed with the arguments Otis had presented in opposition. Often goaded by merchants seeking to protect their goods, mobs formed to prevent customs officials from exercising their warrants. In an era when there were no police to back up officials and with no military around, customs officials had no choice but to back down. The issue actually cooled off in early 1762 when the British captured Martinique and most of the other French colonies in the Caribbean. Suddenly it became perfectly legal for merchants to trade with these now British colonies and the issue went onto the back burner. But political battle lines had been drawn, and would return in later years. Colonists were showing they would openly defy laws that that they considered unjust or even simply against their interests. British officials also seemed to give colonists the confidence that if they stood up to something, officials in London would usually back down. Next Week, the other big colonial issue, western lands, moves back to the top of the list as most of the major Indian tribes unite against the flow of British colonists threatening their land. The Parson's Cause, by A. Shrady Hill from Historical Magazine of the Protestant Episcopal Church Vol. 46, No. 1 (March, 1977), pp. 5-35: http://www.jstor.org/stable/42973539 (free to read online with site registration). The Critical Turn: Jonathan Mayhew, the British Empire, and the Idea of Resistance in Mid-Eighteenth-Century Boston, by Chris Beneke Massachusetts Historical Review Vol. 10 (2008), pp. 23-56: http://www.jstor.org/stable/25478696 (free to read online with registration). Considerations on the Institution and Conduct of the Society for the Propagation of the Gospel in Foreign Parts, by East Apthorp (1763) (from Google Books). The Barrington-Bernard Correspondence, by Edward Channing (ed) (1912). The Anglican Episcopate and the American Colonies, by Arthur Cross (1902) (See, Chap. 6). James Otis's Speech on the Writs of Assistance, by Albert Bushnell Hart (ed) (1902). The Life of Thomas Hutchinson, by James Hosmer (1896). A History of Newfoundland from the English, colonial, and foreign records, by D. W. Prowse (1895). James Otis, the Pre-revolutionist: A Brief Interpretation of the Life and Work of a Patriot, by John Clark Ridpath (1898). An Answer to Dr. Mayhew's Observations, by Thomas Secker (1764) (from Google Books). The Constitutional Aspects of the "Parson's Cause", by Arthur Scott, Political Science Quarterly (1916). Patrick Henry, by Moses Coit Tyler (1898). The Life of Patrick Henry, by William Wirt (1903). Origin of the American Revolution: 1759-1766, by Bernhard Knollenberg (2002 - original 1960). Patrick Henry: Champion of Liberty, by Jon Kukla (2017).